The full size paper chart is available in the on-line shop using your Credit Card (via PayPal) or by contacting us directly here if you don't have a Credit Card (We accept cheques and bank transfers). 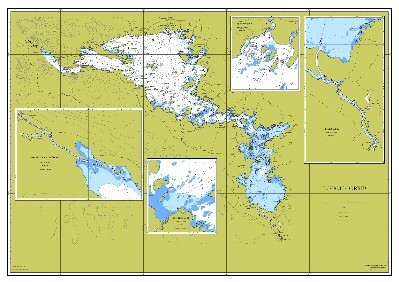 In addition to the exceptionally accurate detail, the chart shows every shallow and official marker on the lake, as well as many of the unofficial markers. It also shows routes commonly taken around the lake. The soundings are completely updated, with many previously uncharted deeps and shallows marked. It is designed as an accompaniment to the GPS chart, and will look terrific wherever you put it! Choose the quantity you require using the drop-down box below (Be sure to choose the correct postage option) and click 'Buy Now'. You will then be directed to the PayPal checkout. CorribCharts does not see any of your Credit Card information, this is all processed through PayPal and is guaranteed 100% safe. When you get to the PayPal checkout please make sure your 'Shipping Address' is the exact address to post chart to. If not, make sure you add your full postal address in the 'Add special instructions to seller' option. You do not need a PayPal account to purchase a paper chart. If you do not have a PayPal account simply follow instructions on the left-hand side of the PayPal checkout.